UPDATED: Mon., Feb. 4, 2019, 7:09 p.m. When a Portland comedian was detained by U.S. Border Patrol agents last weekend at the Spokane Intermodal Center, his account of the incident ricocheted around the internet, quickly gaining the attention of activists and policymakers across the country. But unlike the comedian, Mohanad Elshieky, most immigrants go quietly when they are stopped or arrested at Spokane’s bus and train station. Even if they are handcuffed, booked into a county jail and then taken to the Northwest Detention Center in Tacoma, immigration officials generally refuse to disclose their names, citing a need to protect immigrants’ privacy. The Border Patrol occasionally issues a news release to highlight the arrest of an immigrant with a criminal record, but even then it does not identify the person. The Border Patrol and U.S. Immigration and Customs Enforcement, or ICE, operate with a level of secrecy that separates them from most local, state and federal law enforcement agencies. Police departments, as well as federal agencies like the FBI, routinely provide names and other details of arrests, and further information can be found through public court records. Quiroga said he often depends on secondhand accounts of a client’s arrest, passed along through family members who either witnessed the arrest or spoke to the client by phone after the fact. Sometimes he has to request records under the Freedom of Information Act, a process that can take months or years. Sometimes he tries to contact the agents involved in the arrest. The secrecy prevents journalists and the public from learning about immigrants’ cases, including mitigating factors that might surface in a civil or criminal case. Immigration officials argue the names of arrested immigrants aren’t public information because their cases go through an “administrative” process rather than a criminal one. The policy of secrecy is handed down from the Privacy Office in the Department of Homeland Security, which includes ICE and Customs and Border Protection, which in turn includes the Border Patrol. The immigration courts are secretive, too. They are not part of an independent judiciary, where openness and transparency are sacred principles. They also lack various constitutional safeguards required in criminal trials. Most immigrants appear in immigration court without an attorney. “The judge is from the Department of Justice, which has law enforcement duties determined by the attorney general. Since the government’s prosecutor comes from Immigration and Customs Enforcement … their political priorities may overlap,” Fatma Marouf, a law professor and director of the Immigrant Rights Clinic at Texas A&M University, explained in a Pacific Standard article last year. Paul Dillon is the vice president of public affairs for Planned Parenthood in Eastern Washington, which runs an outreach program for Spokane’s Latino community. Members of the group have been outspoken about Border Patrol sweeps at the Intermodal Center, which have resulted in nearly 230 arrests since late 2012. “I think the argument that they are withholding information on behalf of detainees to protect their privacy, that is blatant misinformation,” Dillon said. He believes immigration agencies simply want to avoid scrutiny. He pointed to a dramatic increase in the number of immigrants without criminal records who have been arrested under the Trump administration, as well as the controversial child-separation policy at the southern border. By scouring online county jail rosters and connecting dots based on scant information from Border Patrol news releases, The Spokesman-Review has managed to identify a few of the immigrants arrested at the Intermodal Center. But usually that is impossible to do without an announcement from the agency or records from the county jail. To see if a person is being held in ICE’s detention facility in Tacoma, one must already know that person’s name and country of origin. 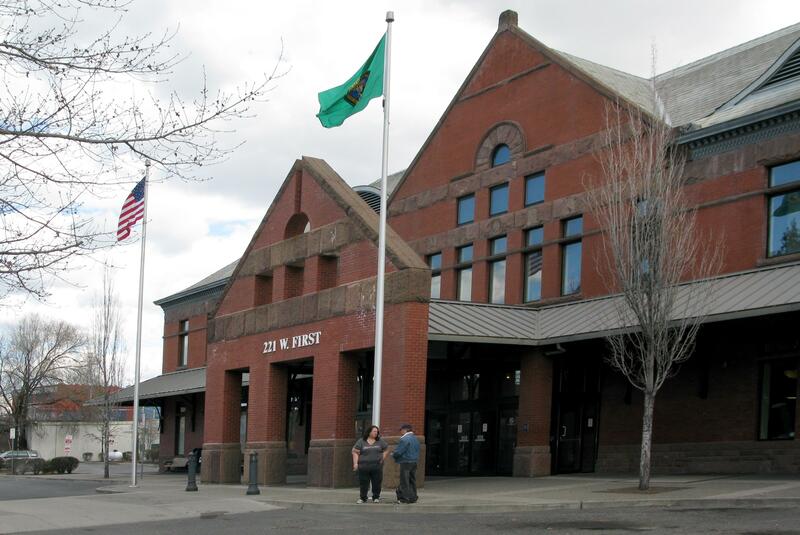 On Jan. 28, a day after Elshieky, the Portland comedian, was stopped and questioned at the Intermodal Center, the Border Patrol issued a news release saying agents had arrested a former Mexican police officer with a homicide charge on his record. But the news release came four days after the man’s arrest, and so his name had already disappeared from online jail records. Editor’s note: This story was changed on Feb. 4, 2019, to correct which day Elshieky was detained. Published: Feb. 3, 2019, 5 a.m. Updated: Feb. 4, 2019, 7:09 p.m.